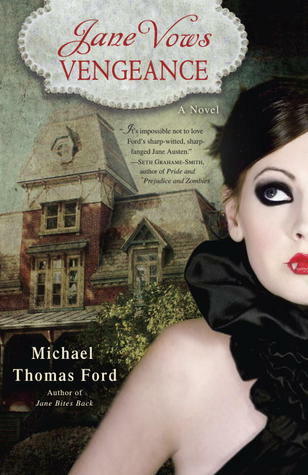 JANE VOWS VENGEANCE is the final installment to MTFord's funny series felt a little flat for me. I was expecting more iconic power struggle between Jane and Miriam a la Monster-In-Law but her quest for mortality got in the way. As expected the wedding didn't go smoothly between Jane and Walter because someone from Jane's past suddenly decided to conveniently pop up. The main plot, Jane and Walter's nuptials, got lost in the mayhem that followed. I've been part of numerous weddings and have seen a lot of Bridezilla episodes to say that planning the wedding on top of crazy in-laws are enough drama. I wish Ford just focused on that instead of embellishing and distracting us with murder mysteries and Arthurian quests. The lines weren't as snappy as the previous book and the issue with Charlotte Bronte wasn't fully resolved. Of course things still ended happily for the couple but the events didn't really highlight the evolution of their relationship. I mean Walter could at least freak out that his fiancee is a vampire and his mother a vampire hunter and not just take the high road and be mature about it. [Miriam] hates your books. She thinks your characters are boring and there are far too many coincidences on your plots. I don't know if this is Ford's personal view on Jane Austen's work but this book is a lot like that comment. Oh, say it isn't so!!! I love this series and haven't read this one yet. I was hoping for more of the good stuff.